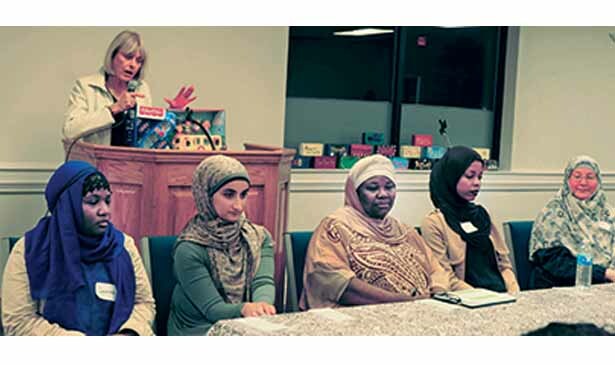 NASHVILLE, TN — Being taunted for wearing the hijab, having their children targeted at school by bullies, their mosques defaced, and being called a terrorist – these are some of the experiences described by five Muslim women from backgrounds as diverse as the US, Somalia, and Kurdistan described to an audience on Saturday. The panel discussion was led by Zulfat Suara, who works as a CPA at Meharry and is the chair of the American Muslim Advisory Committee and President Elect of the Tennessee Women Political Caucus. The meeting was sponsored by the L-Club and held at the Unitarian Universalist church in Bellevue. “This administration wants you to be afraid of your neighbors. When you hear about a terrorist attack, you hope it is not a Muslim because of the fear mongering. The reality is we have a 1.36 million chance of being attacked by a terrorist and a 1.64 billion chance of being attacked by a refugee or immigrant. Yet the Southern Poverty Law center says we have 38 hate groups in Tennessee with [a total of] six million members,” Suara said. Kurdish and social activist Kasar Abdulla, who was named a “White House Champion of Change” described her flight from Saddam Hussein’s campaign of genocide against the Kurds and her arrival in the US at the age of six. After the 9/11 attacks while she was in middle school she was shoved into her locker at school and called a terrorist. She went to a teacher to ask what a terrorist was. People threw eggs at her home. “I was not shocked that Trump won. We Kurds have seen a dictator already. The thing I actually appreciate is he made the invisible, visible. The problem I have is that he also made it O.K.” Kasar Abdulla said. The recent travel bans by the Trump administration affected Kasar Abdulla’s family directly. Sameerah El-Siraj, was born and raised in New York and in the Muslim faith. “Also, being Muslim in an African American community and being black in a Muslim community is hard,” El-Siraj said. El-Siraj described the bullying suffered by her young daughter in school despite it being brought to the teacher’s attention. Then her daughter, Kalima, was scolded when she finally fought back. “Kalima then started an anti-bullying club – with a system of rewards,” as a way to intervene, her mother explained. One of the bullies with whom she gotten into a fight earlier turned to the leader of the bullies and said ‘stop being mean,’” said El-Siraj. She noted that Kalima even recruited the two main bullies into the club. At that point, El-Siraj introduced Kalima. She got a standing ovation from the audience. “It was heartbreaking for my family and for how it affected us and affected the community,” Munday said. Tammy Hanan Harmon, a Tennessee native and white woman who converted to Islam twenty years ago before she met her husband, described the acceleration in the defacement of the Murfreesboro mosque near where she lives. “In the past three months there have been at least three incidents. After Ramadan we went to the mosque to walk and saw profanity everywhere ..with bacon on the ground spelling out bad words. I’m a girl scout leader. I got lots of calls of support and concern from people of all faiths, Bahai, Jewish, Christian… and the Girl Scouts and Boy scouts all volunteered to wash away the paint and grease,” Harmon said. The women recommended that people who want to help to write letters of support, get to know a Muslim personally, attend open houses at local mosques. “Turn off Fox News,” Tammy Harmon said. “Get out there and vote, give a ride, help others to register to vote,” said Abdullah.